MV Agusta’s Brutale range is considered a bench mark in the naked category as all models are packed with state of the art technologies, come with a modern design language and reward you with first class performances. 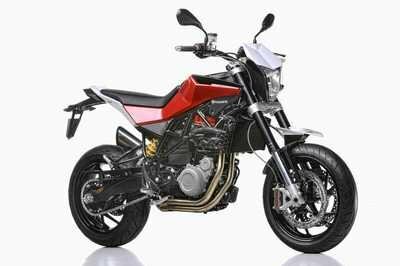 In 2013 the Brutale family has become even bigger, as the company launched a fresh model, namely the Brutale 675. The bike features a refined mechanical design that has been matched with an ultra-technological chassis to deliver top notch performances. 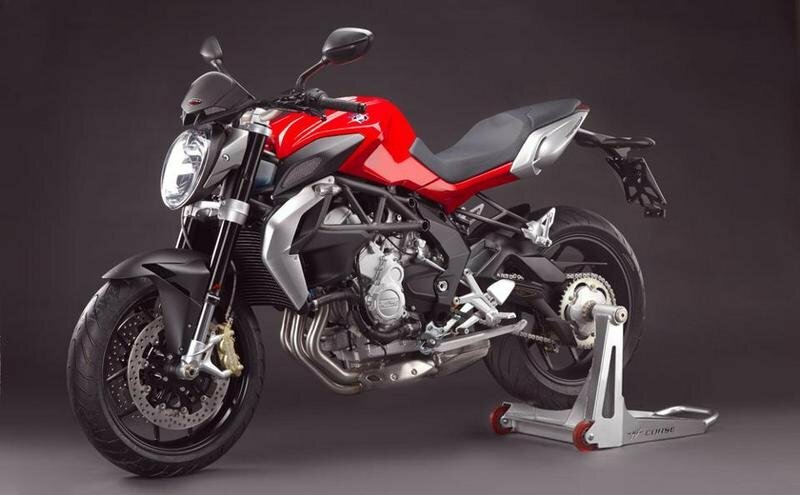 The 2013 MV Agusta Brutale 675 is fitted with a light, agile and powerful engine that is currently the most advanced in the middle-weight segment. The new in-line three cylinder is based on the F3 unit and features a long list of advanced technologies. 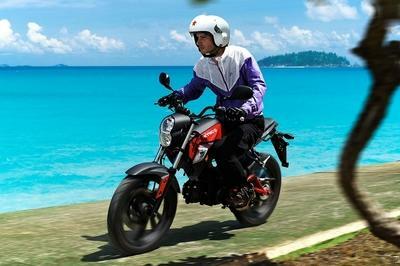 The engine’s output is rated at 108,5 hp at 12.500 rpm and 65 Nm of torque. 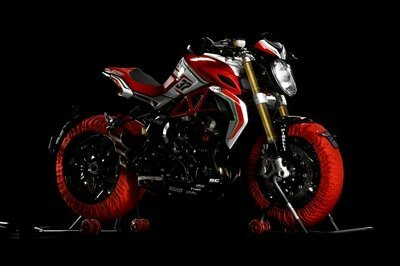 Hit the jump for more information on the 2013 MV Agusta Brutale 675. Today, the Brutale family is about to grow with the introduction of a completely new model that is destined to become the reference in the middle-weight category. 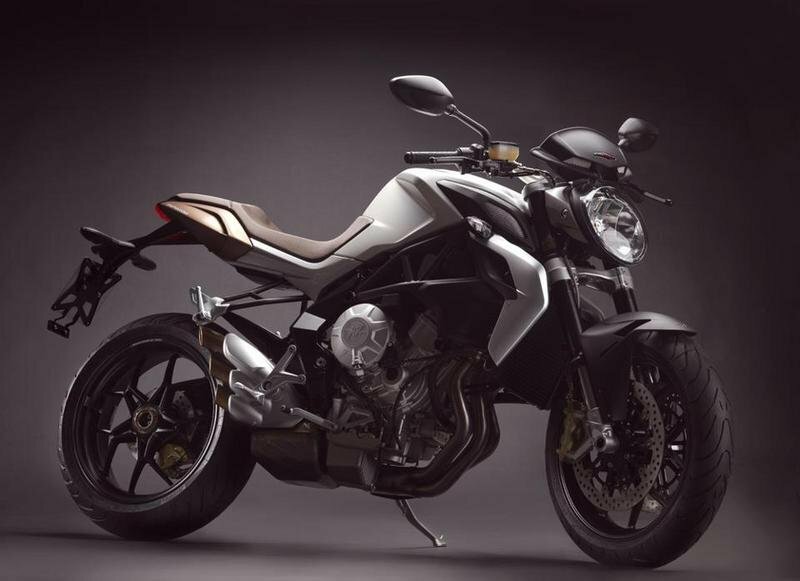 The Brutale 675 is born, a bike that pays tribute to the avant garde styling of the original Brutale and offering performance never before available in this market segment. The incredibly refined mechanical design has been matched with an ultratechnological chassis makes the new Brutale 675 a guaranteed success. An innovative project, exclusive while at the same time accessible to all passionate motorcyclists with various levels of experience. 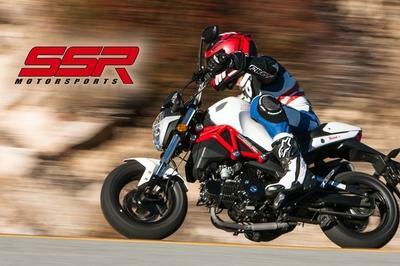 This motorcycle is capable of satisfying even the most demanding riders as well as those that are new to the sport. From street to track, the MV Agusta Brutale 675 is able to take on any situation in stride and offer the pleasure, excitement and emotion that is typically MV. 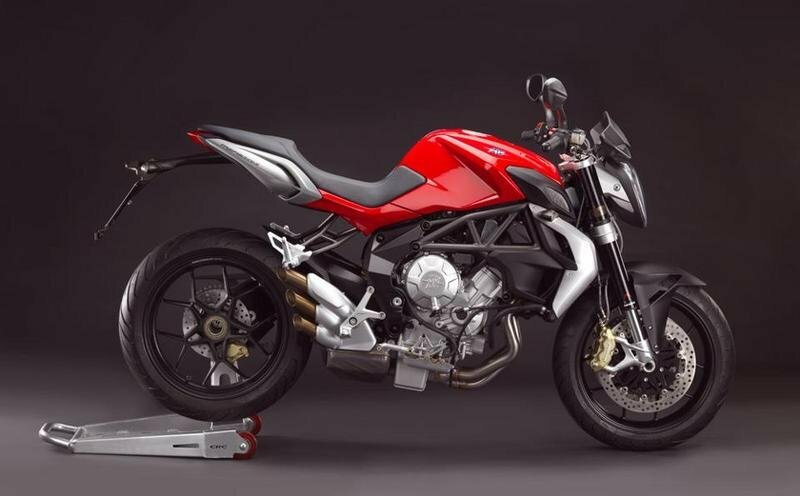 Light, agile and power above and beyond that offered by the competition, the MV Agusta Brutale has a revolutionary engine that is the most advanced in the middle-weight segment. 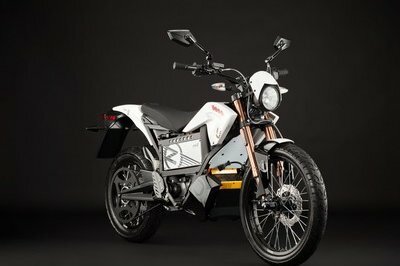 The new in-line three cylinder power plant is derived directly from the F3 and sets new records for compactness and the application of technical solutions only previously seen on MotoGp motorcycles such as advanced electronics with the MVICS (Motor & Vehicle Integrated Control System), a system that integrates the Full Ride By Wire throttle control with integral multi-maps for the engine and traction control. Power output is a staggering 108,5 hp at 12.500 rpm and a torque curve that is more similar to a liter bike rather than a supersport. The chassis, as is the MV Agusta tradition, is without rivals in this category. The frame is a mix of steel tubing and aluminum components that offers a level of rigidity that is destined to make it the reference in its class. 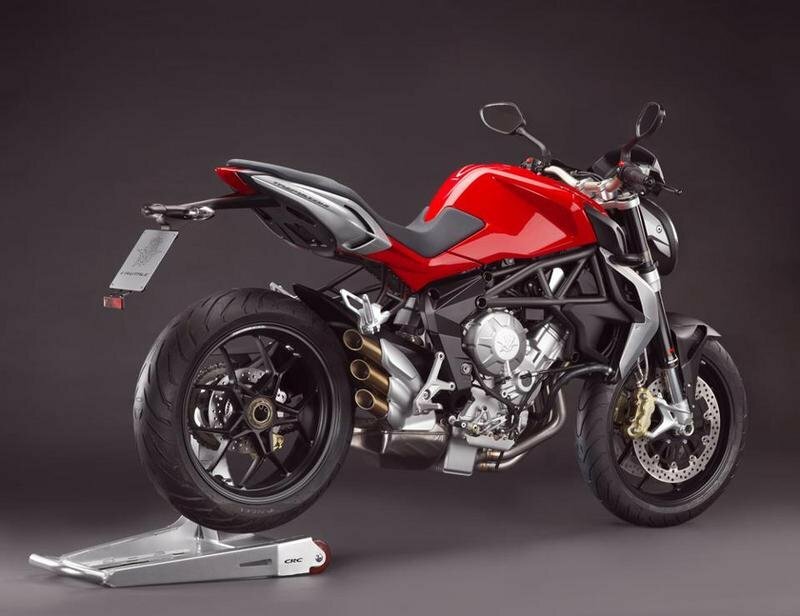 At only 167 kg dry, the MV Agusta Brutale 675 can satisfy even the most demanding of riders. The extremely light weight coupled with the high power output of the engine will allow the Brutale 675 to accompany new riders from the beginning of their adventure on two wheels all the way to the peak of their riding capabilities. 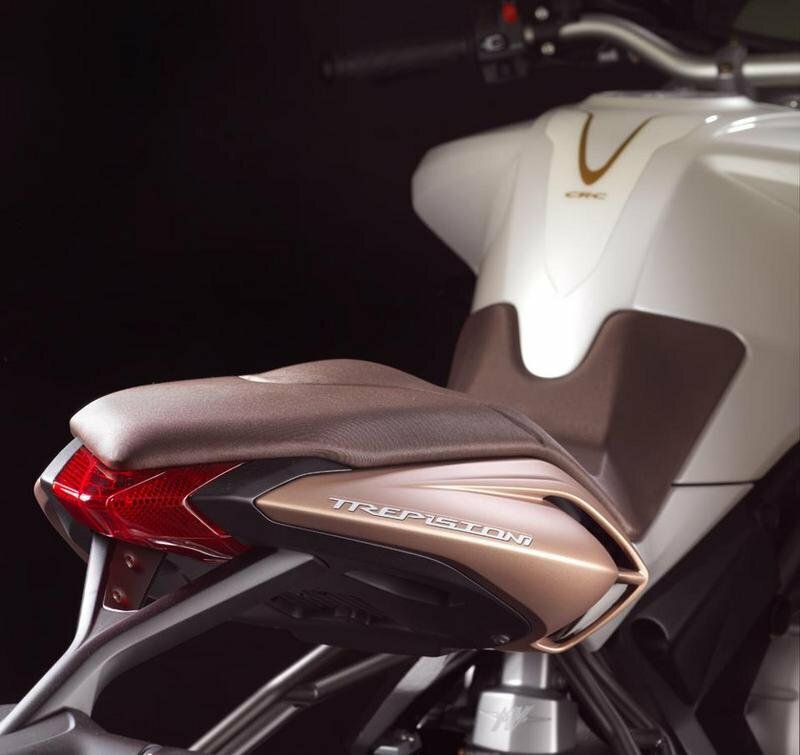 The integration of the fuel tank, seat and tail section is a fulcrum of the design of the Brutale 675 and demonstrates the extreme compactness of the bike. 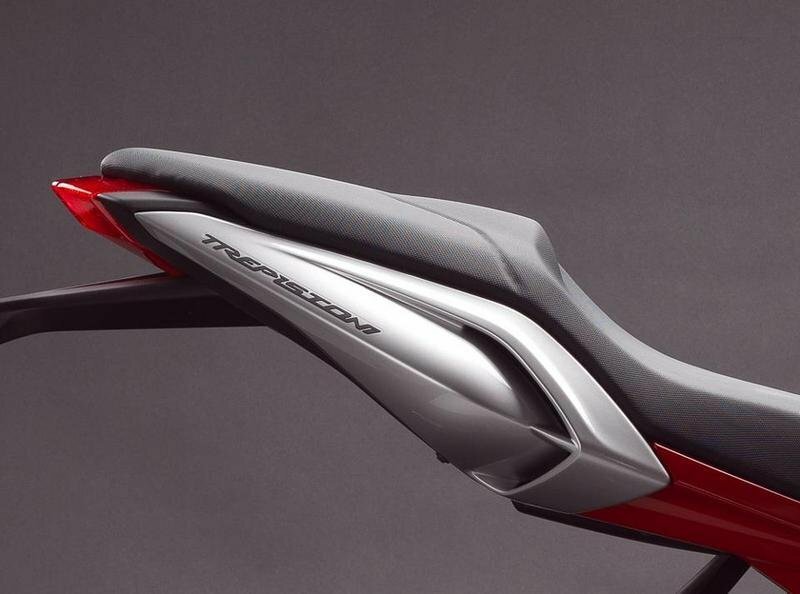 The rider becomes an integrated component of the bike, perfectly inserted into the ultra-short and agile chassis with the narrowest mid-section ever seen on a production supersport that allow all riders to easily place their feet securely on the ground. These details help the rider to immediately become one with the motorcycle and develop the perfect feeling between the Brutale 675 and the pilot. The bike immediately gives the impression that the rider has always ridden this bike as the ergonomics are in perfect harmony with the rider. 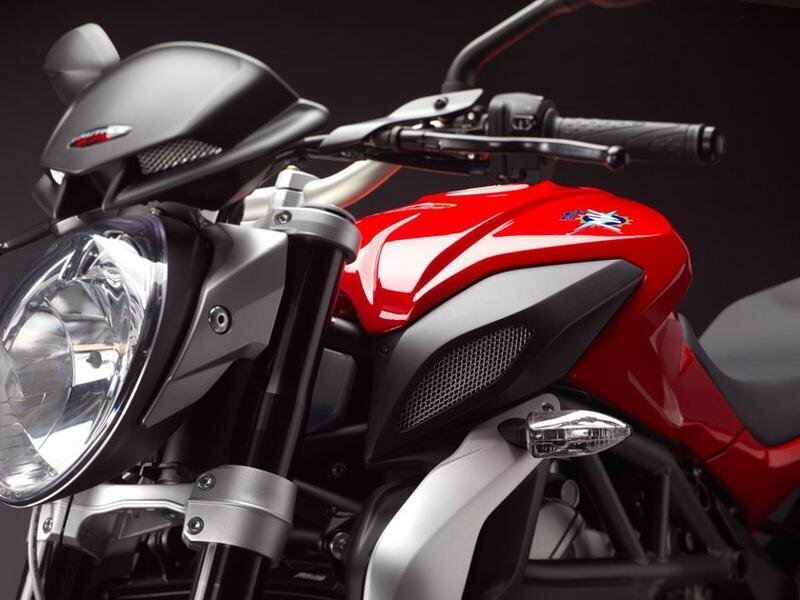 The tail-section is extremely compact, the headlight is classic Brutale and the digital dashboard all contribute to making the MV Agusta Brutale 675 exceptionally unique. The Brutale 675 has a maximum power of 108,5 hp at 12.500 rpm and 65 Nm of torque at 12.000 rpm, but even more important is the huge spread of power and torque throughout the entire rev range and the over-rev after max power that allow the rider to hold a gear even longer if required. Even more important than the peak power is the fact that it is very linear and controllable in all situations. Thanks to this configuration, the three cylinder is an engine capable of taking on city traffic as well as screaming up your favorite mountain road. As with the F3, the Brutale 675 utilizes a counter-rotating crankshaft, which has only been seen on MotoGp motorcycles, this important design feature helps the Brutale reach previously unreached levels of dynamic balance and ease of handling. 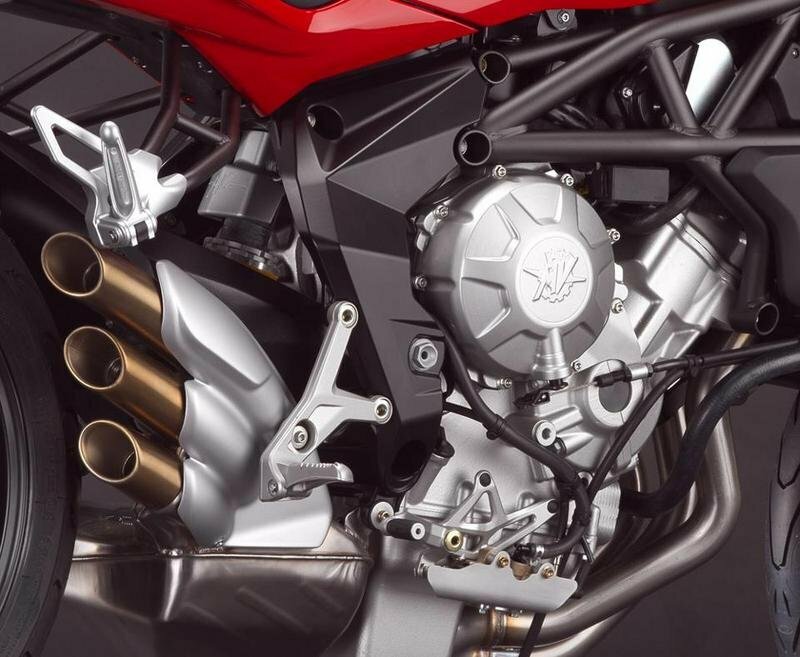 The compact dimensions and reduced weight of the engine place it at the top of the naked category and make the MV Agusta Brutale 675 truly unique, destined to become a milestone thanks to the technical solutions incorporated such as the closed deck shell mold cast crankcase with integrated cylinders and the MVICS. Another important detail is the fact that the oil and water pumps and circuits have been completely integrated into the crankcases which has a big impact on efficiency and the clean lines that are fundamental on a naked bike. The optimum performance of the suspension was a very important point during the development of the Brutale 675. Even a “simple” naked motorcycle needs to have the best that the market offers in terms of suspension performance. The 43 mm upside-down front forks offer feedback that leads the competition and allow the rider to easily take on even the most challenging city streets or tortuous mountain roads with confidence. The rear suspension works through a progressive linkage and has adjustable spring pre-load with 119 mm of rear wheel travel. The new Brutale 675 is available in 3 colors combinations: red/silver, pearl white/matt gold and matt Magno grey/matt antrhrocite for £8,499 and EAS at £8,699. Cycleworld ---- "Because the Brutale 675 is the naked counterpart to the F3 sportbike, the two models share major mechanical components. This may sound logical, but such practical engineering has not always been the case at MV. But as a result of that common platform, the Brutale 675 is priced at a rather accessible $11,498 in the U.S. An eight-level traction-control system and the EAS quickshifter are standard for our market." Autoevolution ---- "It’s absolutely delightful to see a bike which manages to intertwine the flowing, appealing lines of Italian design with the sheer aggressive nature of a bike which is not made for the weak-hearted. And by all means the 2013 MV Agusta Brutale 675 fits this bill perfectly." 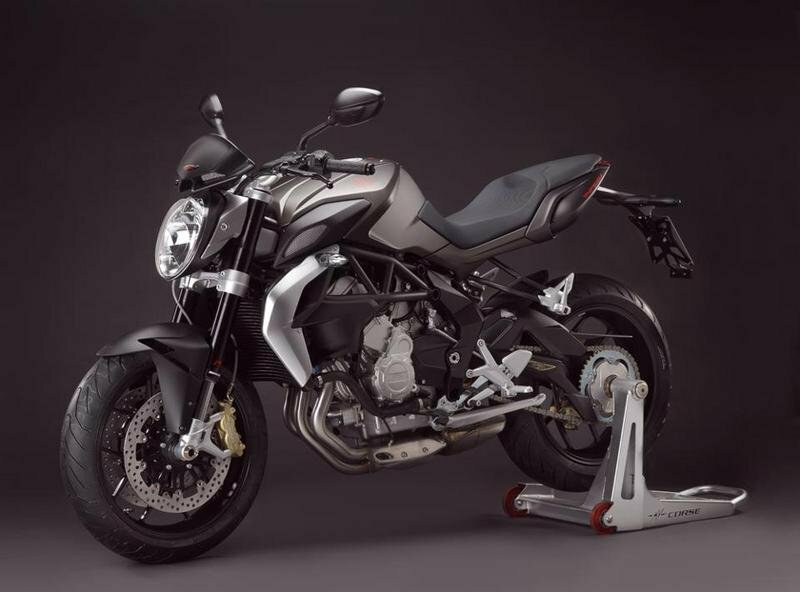 Moto123 ---- "The 2013 MV Agusta Brutale 675 is powered by the brand’s ultra-compact new triple that contributes to optimum mass centralization, with forward-slanted cylinders and a transmission perched above the crankshaft. The DOHC engine uses large steel valves (whereas the F3 gets titanium valves), a fairly high compression ratio for a street bike at 12.3:1, and forged pistons like most modern sport bikes."